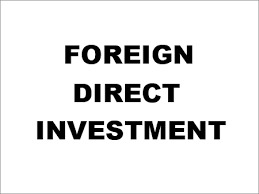 The foreign direct investment (FDI) of India fell by more than 43 per cent to around USD 2.2 billion in May, 2009 as compared to USD 3.9 billion in the same period previous year due to global recession. "FDI was around USD 2.2 billion in May," Department of Industrial Policy and Promotion Secretary Ajay Shankar told reporters on the sidelines of a seminar organised by CII-Institute of Logistics. He also said "we think that liquidity is improving and confidence in the economy is rising. Last fiscal, the government had brought down the FDI target by USD 5 billion from USD 35 billion. The FDI in 2008-09 was USD 27.3 billion as against USD 24.5 billion in 2007-08.